My my journey across Russia by train I came across a curious looking piece of equipment parked in a siding – a track laying machine. 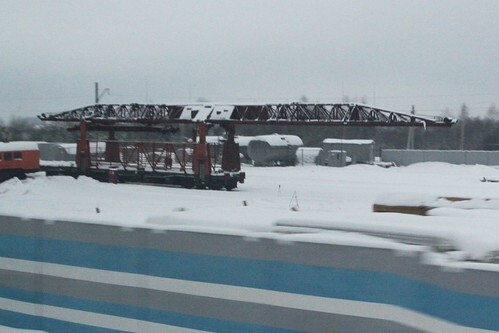 Called a Путеукладчик in Russian, here is a similar machine at work laying track for a new railway line. Track-layer trains consists of a locomotive, a laying crane, flat wagons equipped with rollers for moving packages of rail-sleeper track panels, and one or more trolleys for transporting track panels along the train. The laying crane is a self-propelled machine with a horizontal cantilever boom, under which a track panel is placed on the trolley. On the boom hoisting and traction winches are installed. With the help of the traction winch, trolleys traverse the train and pick up the top track panel, lifted by the hoisting winch. Then the panel is carried out on the trolley along the boom forward and is laid onto the pre-prepared ballast. After docking this panel with the previously panel, the laying crane and wagons run over the newly laid panel and and loads a new panel. Tracklayers can also used as to dismantle a railway, picking up each track panel, loading it onto the train, moving backwards, and repeating the process. Track panels come in lengths of 25 or 12.5 meters, with the machine working at up to 1.2 km/h, with each panel taking 1-2 minutes to lay. The load capacity of the cranes is up to 21 tons. Or you can watch this video of a model КЖУ-571 tracklayer at work. Here a model УК-25 tracklayer is at work building a new railway. While this pair of track layers is renewing an existing railway – one machine removing the old track panels, while the second one lays new ones. This entry was posted in Trains and tagged rail operations, railways, Russia, Russian Railways, track machines, trackwork. Bookmark the permalink.